Fig. 1. (a) Proximitised Rashba nanowire of finite length with gate-tunable Fermi energy and under a parallel Zeeman field Vz. (b) Bound charges ρb arise in the dielectric surroundings, which interact with free charges in the nanowire. (c,d) Non-interacting and interacting spectra of the nanowire. 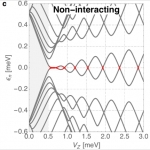 Extended zero modes (in red) in (d) are the result of the interaction-induced pinning, discussed in this work, of Majoranas at zero energy around parity crossings. Article: published in npj Quantum Materials by Alfredo Levy Yeyati IFIMAC researcher and member of the Department of Theoretical Condensed Matter Physics. 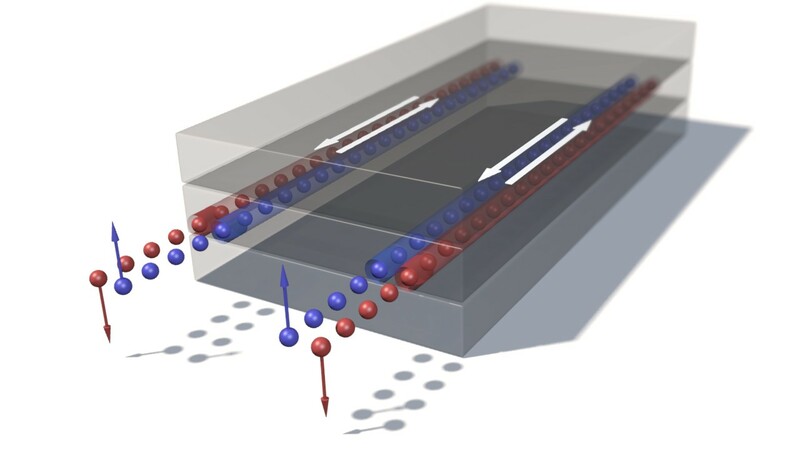 Since the early experimental efforts towards the generation and characterisation of Majorana zero modes in solid state devices, remarkable progress has been accomplished. Recently, this field has seen a revival thanks to new experiments of exceptional quality on proximitised semiconducting nanowires. These experiments provide cleaner devices, with longer mean free paths and much more robust induced superconductivity. Samples of this quality are expected to develop an unambiguous, topologically nontrivial superconducting phase. If the length of the nanowire is much greater than the Majorana length, the wire should host zero-energy Majorana states at its edges, which would be detected as e.g. zero-bias anomalies in tunnelling transport measurements. However, this is not the case of samples of realistic length (see Fig. 1a,c). In this case, the two Majoranas at opposite ends of the wire overlap substantially, which results in the annihilation of the zero energy modes through hybridization, and their topological protection is destroyed. This theoretical expectation is in stark contrast with some recent experiments reporting surprisingly stable zero-bias anomalies in transport. We investigate transport though normal-superconductor nanowire junctions in the presence of spin-orbit coupling and magnetic field. As the Zeeman field crosses the critical bulk value Bc of the topological transition, a Majorana bound state (MBS) is formed, giving rise to a sharp zero-bias anomaly (ZBA) in the tunneling differential conductance. We identify novel features beyond this picture in wires with inhomogeneous depletion, like the appearance of two MBSs inside a long depleted region for B<Bc. The resulting ZBA is in most cases weakly split and may coexist with Andreev bound states near zero energy. The ZBA may appear without evidence of a topological gap closing. This latter aspect is more evident in the multiband case and stems from a smooth pinch-off barrier. Most of these features are in qualitative agreement with recent experiments Mourik et al., Science 336, 1003 (2012). We also discuss the rich phenomenology of the problem in other regimes that remain experimentally unexplored.